Ready to all your training equipment to and from games, be sure to use this Centerline Football Backpack in Black and Anthracite from Nike. This polyester Nike backpack has a large zipped-up main compartment that provides ample storage including laptop pocket. 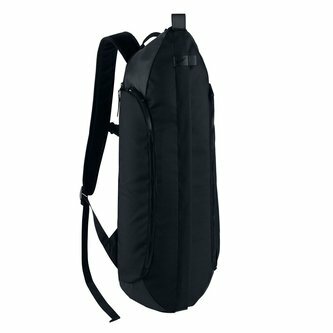 A durable, water-resistant tarpaulin bottom helps keep gear dry, where as adjustable padded shoulder straps make carrying this backpack, easy and comfortable. In a classic looking black and anthracite design, make sure you're using this Nike Centerline Football Backpack. Dimensions: 56cm H x 33cm W x 12cm D approx.